There are many approaches to improving decision-making, including assigning numerical weights, ratings, or scores to factors, criteria, objectives, goals, roles, categories, or attributes. Interestingly, it’s often found that the more complex the decision-making framework, the more opportunity for bias and confusion to enter. Choosing By Advantages (CBA), founded by Jim Suhr, is a simple, easy-to-use system for determining the best decision by looking at the advantages of each option. It seeks to bring simplicity, clarity and a facts-based approach to decision-making, which can often get clouded by emotional factors and confusion over terminology and priorities. CBA’s fundamental rule is, “A disadvantage of one alternative is an advantage of another alternative, and there are no exceptions.” It’s about identifying the differences in advantages. 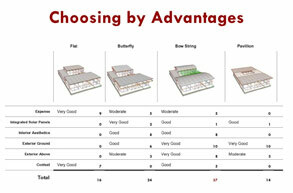 PrayWorks often applies the Choosing by Advantages approach across the many decision-points of a building project. It helps strip out the emotions and egos involved, and roots decisions in relevant facts.